Where are you in your professional life cycle? Click on our infographic to learn how we can help at each stage. With well over 3,000 members, NAAE's Communities of Practice is a great place to make connections with other agricultural educators from all over the United States. Members post ideas, have discussions, and share tried-and-true techniques for creating a better ag program. Visit Communities of Practice. We are also always looking for guest contributors. For more information on writing and article for News & Views, contact the NAAE Communications/Marketing Director. Applications must be submitted to NAAE from the state agricultural education association leadership on behalf of a NAAE active member. There is no deadline for submitting applications for this program. Applications should be submitted at the time of the need. Complete details are included in the application form. "After a tragic fire, a lot of time is spent on insurance details, so the quicker you can get clothes, food and furniture the sooner you can spend time on the rebuilding process. Your relief fund was a perfect way to help us take care of immediate basic necessities. My mother and I thank you so much for your support. I have always been a fan of the NAAE and the great leadership and services offered members. Your relief fund was a service I didn't know existed and certainly thought I would never need, but I can't tell you how much this kind of support means for an expeditious recovery." By check: Make your check payable to NAAE, and put "Ag Ed Relief Fund Donation" in the memo line. Mail to NAAE, 300 Garrigus, Lexington, KY 40546-0215. Questions? Contact Jay Jackman, NAAE Executive Director. Student members enjoy all of the same benefits as active individual members, including the same level of liability coverage (see above), but NAAE also has programs and initiatives targeted specifically for those who are preparing to become agricultural educators. Scholarships awarded during your student teaching semester. Applications are due in May for the upcoming year, so double-check to make sure you apply at the right time. Learn more. Student members are invited to participate in all NAAE professional development, including workshops, online professional development opportunities and Communities of Practice. To learn more about these opportunities, follow this link. This program allows specially selected agricultural education majors to spend a day during National FFA Convention immersed in inquiry-based teaching methods and agriscience. Learn more. 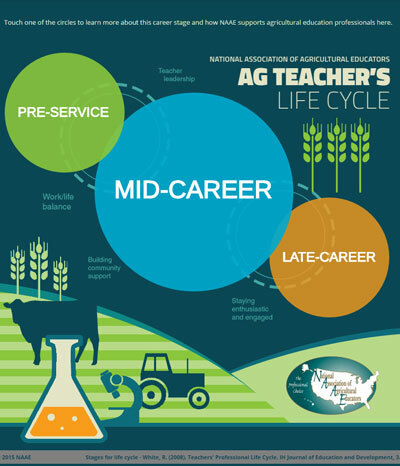 Each year the National Teach Ag Campaign selects an elite group of agricultural education majors to represent the profession and encourage others to teach agriculture. This program is only open to current NAAE student members. Learn more. Each year the National Teach Ag campaign holds a contest for collegiate agricultural education student organizations to show their Teach Ag pride! The contest changes each year, so follow this link for details. The webpages will be included on the state affiliates section of NAAE's website. This program has been started as a way to help states who do not currently have a website. If your state association already has its own website, you do not have to start using the NAAE program. NAAE will still have a link from this page to your state association's website. For complete , download this document.